What a great week! We packed a lot into the last seven days, and I want to share our highlights. This was one of those perfect moments that we were lucky to catch on film. One of these is definitely going into a frame soon. Last Friday night, I joined some of my good friends and my mom at a painting party! My friend Ashley organized the event and chose a blue mason jar vase as our masterpiece. I had never done a painting class before, and I wasn't sure what to expect. We all started with black smears, and managed to make something beautiful out of them :) We were there from 6:30 until nearly 11! When I brought the painting home, the little boys were asleep. On Saturday morning, I woke up to Nolan at the side of my bed, saying, "Mommy, when you were at your painting place with MorMor, we really missed you! I went into the kitchen, and saw your painting, and it was beautiful!" Aww. On Sunday, we celebrated Grandma Alice's birthday! We indulged in pizza from our favorite spot and ice cream cake. This week, we've been crazy about HEARTS! Heart-shaped donuts are the best kind! And how did I never think to cut strawberries into hearts before?? Hope you enjoy this Valentine's weekend! We are looking at a high of 7 tomorrow--stay warm! 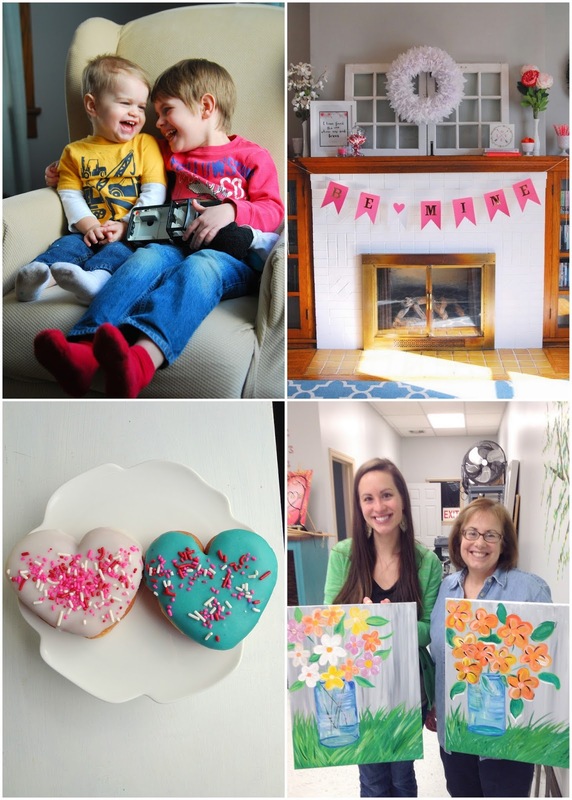 For more heart-shaped fun, follow along @rachel.zimm on Instagram! P.S. Astleigh and I are hosting an Instagram challenge throughout the year. Each Monday a new theme will be posted. During the week, post a photo that gives your take on the topic. Get creative, get colorful, get unique! And on Fridays we'll pick our favorite and share it on our feeds! You in?! We'll be sharing next week's topic on Monday. And you've still got time to post a photo for this week! The theme is "Valentine's". Happy weekend Rachel and family. Your boys are growing so fast. Love your paintings... I was wondering where the black smears would play into the scheme, and I see it all now. Very clever with the eggs... Have a great Valentines weekend! Looks like a busy but fun week. That picture of your boys together is beautiful. Frame it for sure!! Have a wonderful weekend! !